Deutsche Telekom confirmed multi-vendor interoperability on a 100 Gigabit Ethernet long haul link on TeraStream pilot network in Croatia. The tests, which were a joint effort between Alcatel-Lucent, Cisco Systems, Hrvatski Telekom and Deutsche Telekom, represent an important milestone towards the future of generally available 100GbE networking. The actual link, the industry’s first of its kind, consisted of 600 km of Standard Single Mode Fiber (SMF) between the cities of Split and Varazdin using leveraging the TeraStream colorless, open spectrum, passive network. The 100 Gbps signal, carrying live production traffic, used ITU standard 50GHz spacing via a high gain forward error correction algorithm capable of achieving 10Gbps comparable distances. The implementation in this test used pre-standards, aligned in ITU Study Group 15. Multi-vendor interoperability on the 100 Gigabit Ethernet (GbE) long-haul DWDM links was established between IP routers from Cisco Systems and Alcatel-Lucent. Cortina Systems also provided technology for the tests. "The need for bandwidth is constantly growing. This milestone is another important step towards the future of generally available 100GbE networking. Leveraging the TeraStream passive network and the jointly developed standard, we can achieve drastic cost savings in the area of optical transport. We envision that this will also be the most cost efficient optical interconnect for datacenter applications. We are pleased with the latest advancements from the vendors," stated Bruno Jacobfeuerborn, Group Chief Technology Officer, Deutsche Telekom AG. "In order for us as a company to achieve success in the future, we need to have networks that can support the most advanced communications and services,” said Ivica Mudrinić, President of the Management Board of Hrvatski Telekom. “I am especially proud of two things: Firstly, that Croatia with Hrvatski Telekom is the first country in the world to install this innovative technology which will become key to our future success, to the development and competitiveness of the economy and will improve the lives of individuals. I am also proud of our Croatian experts who, together with colleagues from Deutsche Telekom, are implementing this highly demanding, innovative network concept." 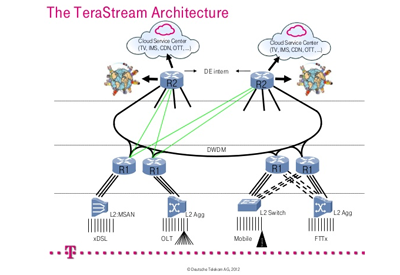 In December 2012, Deutsche Telekom AG together with Hrvatski Telekom (HT), Deutsche Telekom AG’s subsidiary in Croatia, launched its TeraStream pilot network in Croatia. TeraStream is an industry leading network concept, based on a cloud enabled IP architecture. The pilot features 100 Gbps links over a filter-less DWDM system. HP is building an enterprise-class SDN open ecosystem with the upcoming release of an HP SDN Developer Kit (coming November 2013) and followed by an HP SDN App Store (opening first half of 2014). The company said it goal is to create new business opportunities for partners while providing a simple way for customers to purchase and deploy network services. The HP SDN Developer Kit provides developers the essential tools to create, test and validate SDN applications, leveraging HP’s SDN infrastructure and full complement of support services. The SDK supports HP VAN SDN controller with API documentation, developer guide and sample code. Current SDN ecosystem partners registered for the HP SDN Developer Kit include Aastra, Blue Coat Systems, BlueCat, Citrix Systems, Ecode Networks, F5, Infoblox, Infranics, Intel, KT Cloud, Microsoft, MIMOS, Mitel, NTT, PwC, Qosmos, Radware, Real Status, Riverbed, RMIT University, ShoreTel Inc., Samsung, SAP, Tech Mahindra, VMware, Versatile and Websense. The planned HP SDN App Store will let customers browse, search, purchase and directly download SDN applications onto their Virtual Application Networks SDN controller, creating a new business model for how network services are purchased and implemented. The SDN App Store will include applications developed by HP, applications jointly-developed with partners, and partner-certified and community-created applications. To complement this open SDN ecosystem, HP has added OpenFlow support to 10 new routers in the HP FlexNetwork portfolio, including the HP MSR2000, 3000, 4000 and HP Virtual Services Router (VSR) Series routers. These additions build on the existing OpenFlow enabled portfolio of 50 switches, representing more than 25 million installed ports. 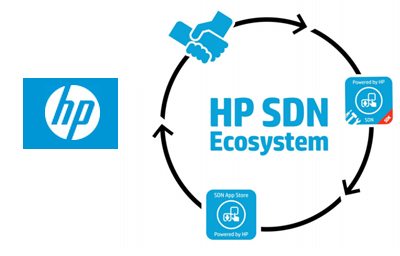 View the full list of partners on the HP SDN Ecosystem Partners web page. 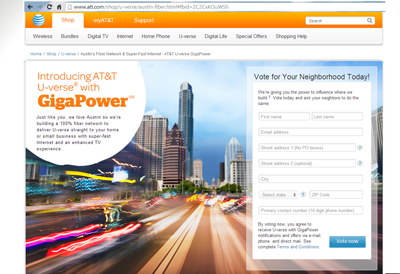 AT&T has begun deployment of a 100 percent fiber Internet broadband network in Austin, Texas, promising download speeds up to 1 Gigabit per second. "Austin embodies innovation and social consciousness, and is the heart of a vibrant, ever-evolving tech culture and entrepreneurial spirit," said Dave Nichols, President – AT&T Texas. "With our all-fiber U-verse services, we are building the foundation for a new wave of innovation for Austin's consumers, businesses, and civic and educational institutions. It's about engaging the full community and empowering the city and its people with all that technology can offer us. This investment will help attract new business and new jobs to Austin." In April 2013, Google selected Austin as the second rollout city for its Google Fiber project. China Mobile has selected Alcatel-Lucent’s lightRadio 4G TD-LTE overlay for its nationwide rollout. Alcatel-Lucent said this award represents 11% of CMCC’s strategic plan to deploy more than 207,000 TD-LTE base stations in China by the end of 2013. Alcatel-Lucent noted that it has been closely involved with China Mobile in developing TD-LTE from the inception of the technology, and successfully demonstrated the first call using the platform more than five years ago, demonstrating HD video delivery over it three years ago. Alcatel-Lucent also showcased TD-LTE to the world during the Shanghai World Expo, another highlight in the journey of TD-LTE from prospect to reality. "This is an extremely significant win for Alcatel-Lucent and we look forward to helping China Mobile rapidly deploy the largest mobile broadband network in the world. By leveraging the ultra-broadband capabilities of our innovative TD-LTE lightRadio solution, China Mobile will have the ability to greatly expand mobile broadband coverage with a consistent, high quality subscriber experience, including challenging environments such as inside commercial and residential buildings," stated Michel Combes, CEO of Alcatel-Lucent. Intel agreed to acquire Sensory Networks, a start-up which specializes in pattern matching and acceleration software technology, for approximately US$20 million. Sensory Networks developed "HyperScan" high-speed, L4-L7 pattern matching software that accelerates deep packet inspection applications running on Intel processors. The company was founded in Sydney Australia and is headed by Sab Gosal. 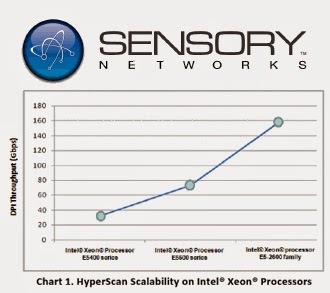 In 2012, Sensory reported that its HyperScan library delivers DPI throughput of 160Gbps with linear scalability, based on an intensive benchmark of HyperScan on a dual-socket platform (8-core, 16 threads per socket) using the new Intel Xeon processor E5-2600 family and Intel C604 chipset, scanning against a tier-1 commercial IPS signature set. HyperScan fully scales across Intel architecture, extending from the Intel Atom processor to the highest performing Intel Xeon processor. Huawei is rolling out a new version of its MA5600T all-in-one broadband access platform with the ability to support vectoring across 896 copper access lines -- more than twice the average line capacity of alternative vectoring systems. The vectoring system improves line access speeds by adding reverse crosstalk noise to cancel signal noise thus boosting copper access speeds to over 100 Mbps. Huawei said a special vectoring algorithm, powerful vectoring processing and node level vectoring (NLV) technology, enables its MA5600T to support up to 896 lines. The MA5600T could be deployed at a central office or in an outdoor FTTC cabinet to provide large-capacity vectoring access. 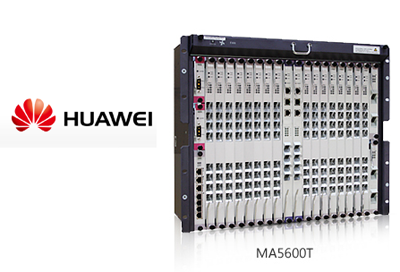 Huawei's MA5600T shares its vectoring service boards with the mid-size MA5603T, further improving the backplane capacity of converged optical and copper access platforms to 8.8 TB. Additionally, MA5600T is compatible with copper-based access boards (including xDSL, POTS, and Combo) and optical fiber–based access boards (including GE, GPON, 10GE, and 10 GPON). Mr. You Yiyong, President of Huawei access product line, said, "Huawei's large-capacity vectoring system can solve the CO DSLAM access speed improvement issue and provide end to end, any node ultra-fast broadband access. Committed to resolving operators' requirements, Huawei will continue to research high-speed access technologies and, together with the industry, provide more efficient end-to-end ultra-fast broadband access solutions." Huawei announced the appointment of Mr. Eric Xu as it next rotating CEO. 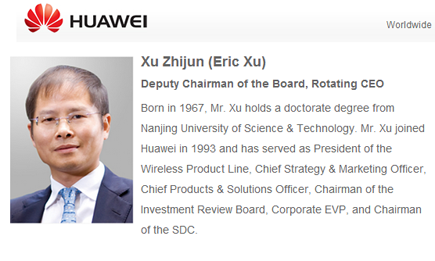 He will serve as Acting CEO of Huawei from October 1, 2013 to March 31, 2014. Huawei said its rotating CEO acts as the primary person of the company’s operations and crisis management during his tenure and is responsible for convening and chairing the meetings of Board of Directors’ Executive Committee and the company’s Executive Management Team. In April 2012, Huawei has adopted a rotating CEO model in which which a small group of executives take turns to fulfill CEO duties. At the time, Mr. Ren Zhengfei said a group of rotating and acting CEOs should be more effective, compared to a single CEO, who is otherwise expected to handle multiple affairs each day. The rotating and acting CEOs take turns leading the company for six months. After the rotational period is over, the non-acting rotating CEOs will still be part of the company's decision-making nucleus. Etihad Etisalat, Mobily, has selected Ericsson to introduce 4G/LTE 1800 in the Western region of Saudi Arabia and to transform and expand its 2G, 3G network for improved coverage and speed with the delivery of end-to-end network features (radio, core and service layer charging). Financial terms were not disclosed. "As the uptake of smartphones increases in Saudi Arabia, so does the demand on connectivity and advanced services, and it becomes increasingly important to ensure that the network performs well in order to maintain subscribers’ loyalty," said Ali Eid, Head of Ericsson, Saudi Arabia. "Mobily’s strategic business objectives have always ensured that the company deploys the most advanced technology available in order to maintain subscribers’ satisfaction. Armed with Ericsson’s scalable and innovative solutions, Mobily will not only be able to accommodate the additional pressure on the network expected during Hajj, but will also be able to provide subscribers with an enhanced mobile experience throughout the year." Radisys announced the appointment of Steve Collins as Vice President of Global Sales. Previously, Collins served as VP and GM of Americas Sales and Corporate sales strategy for Sonus Networks.